The driving force behind Laure Paschoud’s collections for her label, Atelier Laure Paschoud, is the ability for each piece to tell a story. Whether inspired by a concept, like Braille, in her A/W 2012 collection or an element, like Air, in her most recent collection, the resulting masterpiece is one that is innovative and thought provoking. Paschoud’s most recent collection is titled, ‘There is Something in the Air,’ and features blended materials illustrating the different strength of winds and their movements. The motion is shown through the contrasting bright and dark colors and embellishments that serve as a graphic catalyst for that movement. The embellishments consist of ceramic buttons by artist Sylvie Godel and prints by graphic designer Gilles Magnoni. The designer states that the goal of Atelier Laure Paschoud is to produce “socially and environmentally responsible clothing.” Each piece in her collections are comprised of natural materials that are certified organic, fair trade, or recycled. With those fabrics, this A/W 2013-2014 collection features voluminous silhouettes and pieces that appear to transform with a few steps. 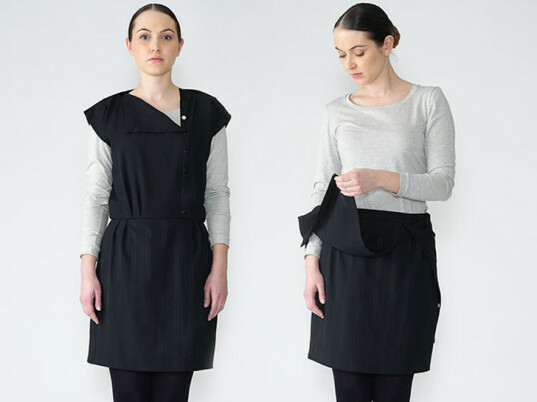 A skirt transforms into a dress, a cardigan into a scarf, and a coat back into a dress. Each piece evolves based on your needs, making each piece last, as it is constantly renewed. Not just for novelty, this is an important element in the designer’s collections. “Each piece is built to last, in time, in style as well as through its quality of fabric and production,” the designer tells Ecouterre. Designed in Paschoud’s home county of Switzerland, each piece in the collection is made in Bosnia, in a structure that respects fair working conditions, and is run by a Swiss-Bosnian family. The production workshop is focused on rehabilitating Bosnia from its war-torn history and instilling knowledge of sustainability in clothing and fabrics within the area. The designer enjoys working with volume and using that element to make each piece unique to each individual wearer. The design process is also an opportunity for Paschoud to work with like-minded artists interested and focused on sustainability. For Paschoud, fashion is a useful and universal art that she hopes translate her vision for fashion: “beautiful and useful, sustainable and consciously made.” Message received. The driving force behind Laure Paschoud�s collections for her label, Atelier Laure Paschoud, is the ability for each piece to tell a story. 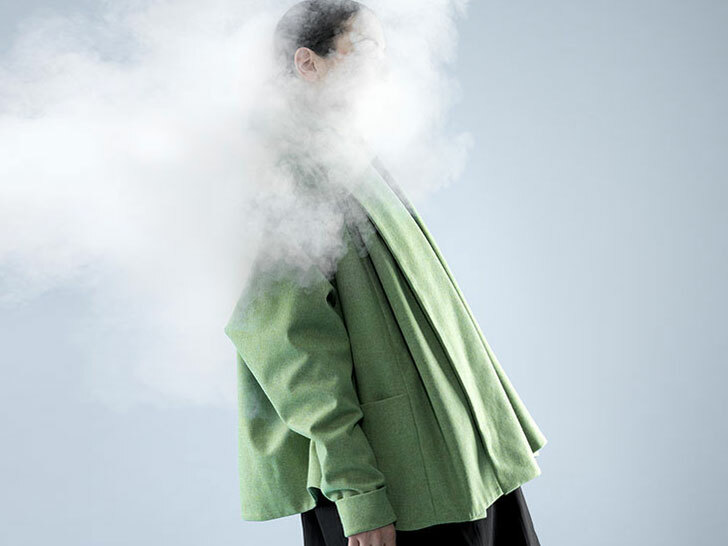 Whether inspired by a concept, like Braille, in her A/W 2012 collection or an element, like Air, in her most recent collection, the resulting masterpiece is one that is innovative and thought provoking. Paschoud�s most recent collection is titled, �There is Something in the Air,� and features blended materials illustrating the different strength of winds and their movements. The motion is shown through the contrasting bright and dark colors and embellishments that serve as a graphic catalyst for that movement. The embellishments consist of ceramic buttons by artist Sylvie Godel and prints by graphic designer Gilles Magnoni.